Mac & cheese– such a classic comfort food that everyone loves. You would never think it could get any better than that, but you’d be wrong. 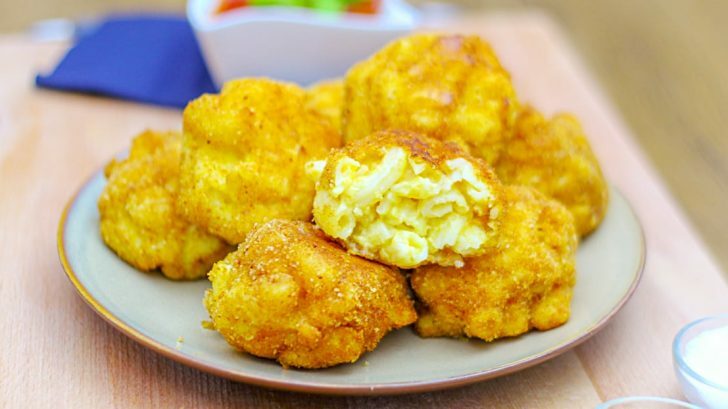 Take your favorite mac & cheese recipe, roll them into balls, and deep fry them. That’s how you take mac & cheese up to a whole new level. We have our own classic recipe that we think works best with the deep frying. Heres how to make it. To get started, you’ll want to make your mac & cheese. This starts by making a roux, which is basically a fat & flour mixture that allows milk to thicken and cheese to melt evenly. Over medium heat, melt your butter. Once it’s melted, add your flour and mix it in. You’ll want to cook this for about 2-3 minutes, or until it smells like cooked pie crust. Add your cold milk, whisking constantly until it’s well incorporated with no lumps. Keep cooking it until it thickens, another 2-3 minutes. Add your salt and pepper to taste, along with any other seasonings you’d like. Turn your heat down to low and add your cheese, whisking it in until it melts. Your cooked macaroni should be added at this point and mixed with the cheese sauce. After the basic mac & cheese is done, wait for it to cool off enough for you to handle. Roll the mac & cheese into balls, then freeze these balls for an hour. Crack your eggs in one bowl and pour your breadcrumbs into another. Dip the balls into the egg mixture, then the breadcrumbs. In a deep skillet, pour in your oil and wait for it to come to temperature. You’ll know it’s ready when you drop a few breadcrumbs in and they start to bubble and sizzle. Fry the mac & cheese balls until golden brown, flipping once to get both sides. Once it’s done being fried, drain them on paper towels, and you’re ready to eat them! These are great with ketchup, ranch, or even more cheese sauce. Regardless of how you eat them, you’ll be addicted in no time.